The best kind of dinners are when all of the components are delivered to your table hot and fresh all at once. This is not easy when you are trying to coordinate meat and vegetables at the same time! My solution to this cooking conundrum is a classic sheet-pan dinner. 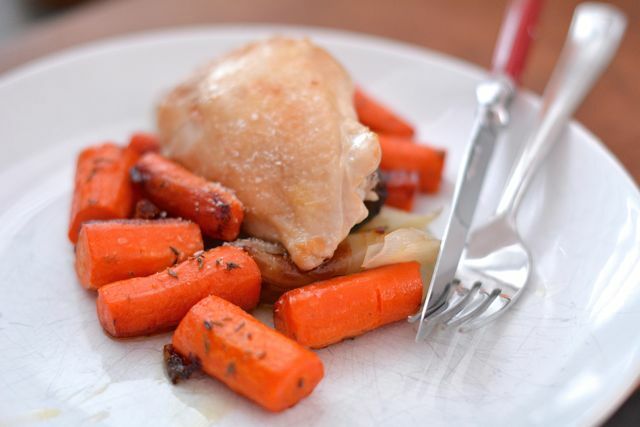 I pile chicken, vegetables, oil, and seasonings onto a pan and roast them together in the oven. Everything is finished at the same time and can be served hot without any portion of the meal straggling behind because it isn’t ready. The best part about this kind of roast vegetable dinner is that the ingredients are flexible. So long as you stick to the general formula and weight of the vegetables, you can easily use whatever you have on hand. And when dinner is all done, all you have to do is roll up the parchment and clean-up is done! Step 1: Preheat the oven to 450 degrees F. Line a large, rimmed baking sheet with parchment paper and set aside. Step 2: Use a paper towel to dry the chicken. Sprinkle both sides of each chicken piece with salt and pepper. Step 3: Place the cut vegetables on the baking sheet and drizzle them with olive oil and toss well. Add a pinch of salt and the thyme, and toss again to make sure it is evenly distributed. Place the chicken skin side up on top of the vegetables and place the pan in the oven. Roast for about fifteen minutes. Step 4: Remove the pan from the oven and turn the vegetables with a pair of tongs. Brush the chicken skin with a little more olive oil and return the chicken to the oven. Roast for an additional fifteen minutes. Remove the chicken from the oven and allow it to rest for ten minutes. Then serve the vegetables and chicken warm. Sprinkle with salt and more thyme to season if desired.